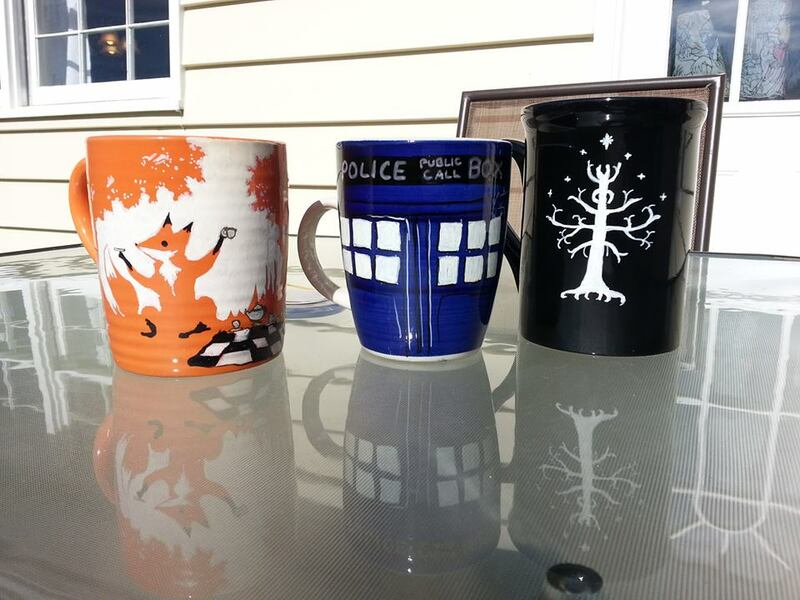 Left is a picture of my daughter’s fox friend, Orange Pekoe; the middle is a TARDIS mug that’s bigger on the inside (I wish! ); and lastly a lovely Gondor mug for a cup of second breakfast blend. I recently discovered on Pinterest how to make personalized mugs that will stand the test of washing up. Well so many of them said to use just regular sharpies and from “conditioning the mugs” with anything from oven baking, to hot water tempering, to a heavy shellac of krylon crystal seal bond was guaranteed to keep the sharpie from washing off. Tell that to poor Tom Servo!! RIP Sir Htom Sirveaux. 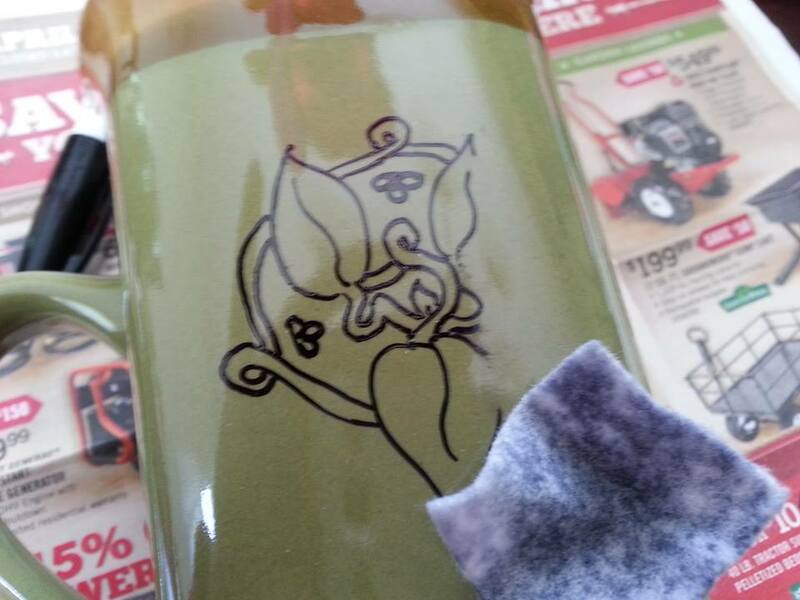 Baked alcohol-based sharpie with baked on Krylon crystal seal. Came off with a soft sponge in cold water SURPRISINGLY easy. So digging through the hearsay and the tried-and true, I stumbled on the winning combination: OIL-based paint markers and baking. These are ordinary oil-based paint sharpies that you can get at any craft store. They run about $4 each and come in a fairly limited range of colours. 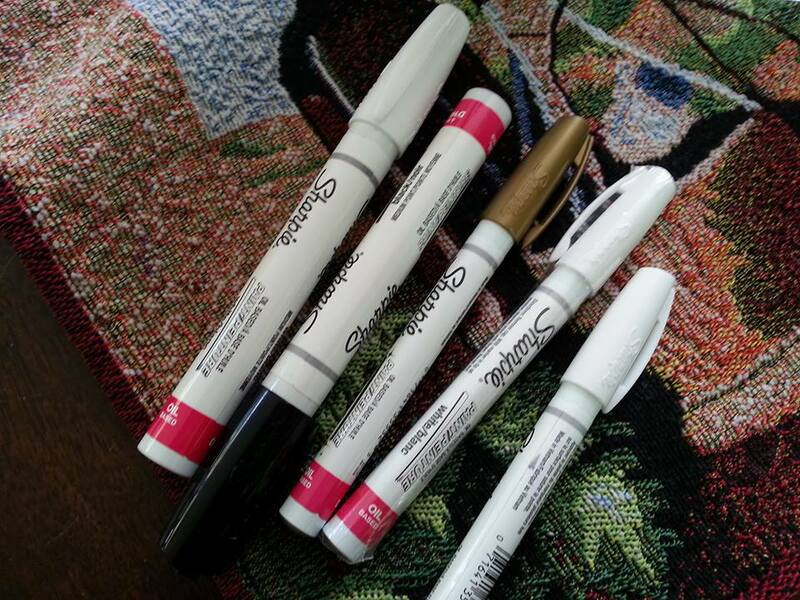 You don’t have to buy sharpie brand but they MUST be oil-based and state that they will bond to glass or porcelain or you’re wasting your time and money. 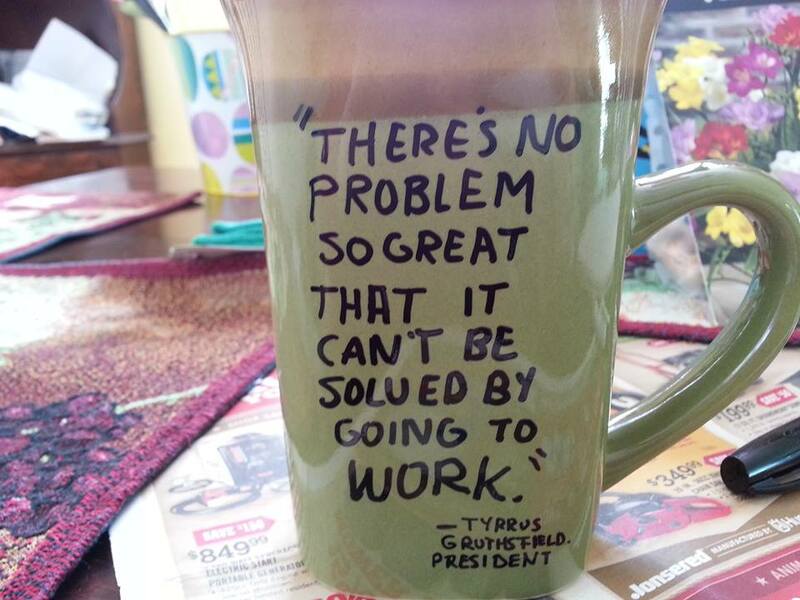 All you need now is a mug to decorate and an idea! 1. 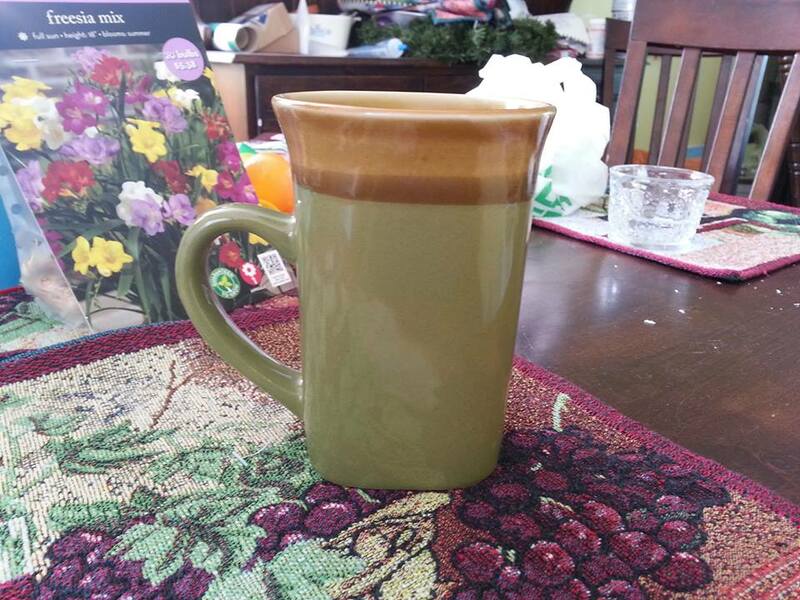 I bought this mug today at Dollar Tree for $1 before taxes. Again, I’m limited by the colours that are there (I had a choice of orange, green, blue and yellow today) so I have to think really hard about what I feel like drawing. 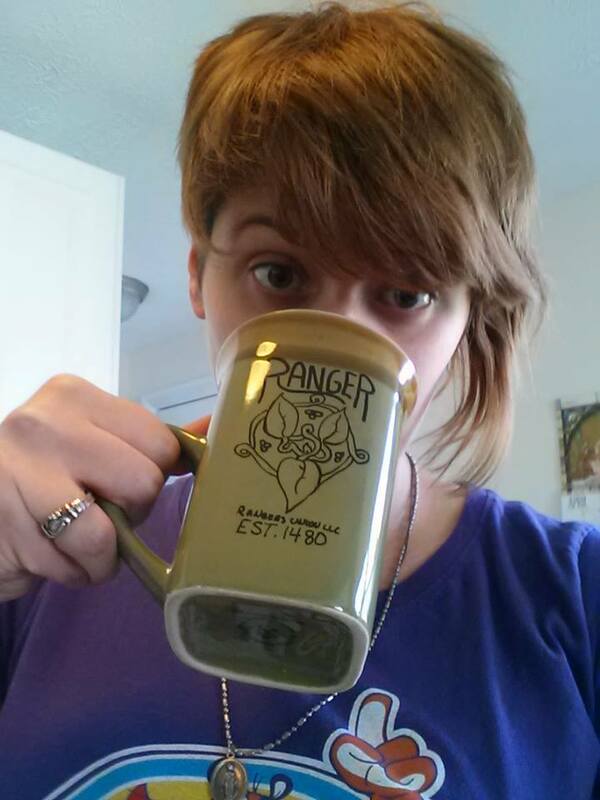 Check the mug and get one without any cracks or pitting. We’re going to be baking this guy so teeny problems will turn into bad ovens when baked. Before you start, you should take off all stickers and wash the mug in soap and water, making sure to dry it completely before starting. Seriously $1. Too bad everything comes in avocado for $1. 2. Come up with your idea and DRAW IT FIRST ON PAPER. 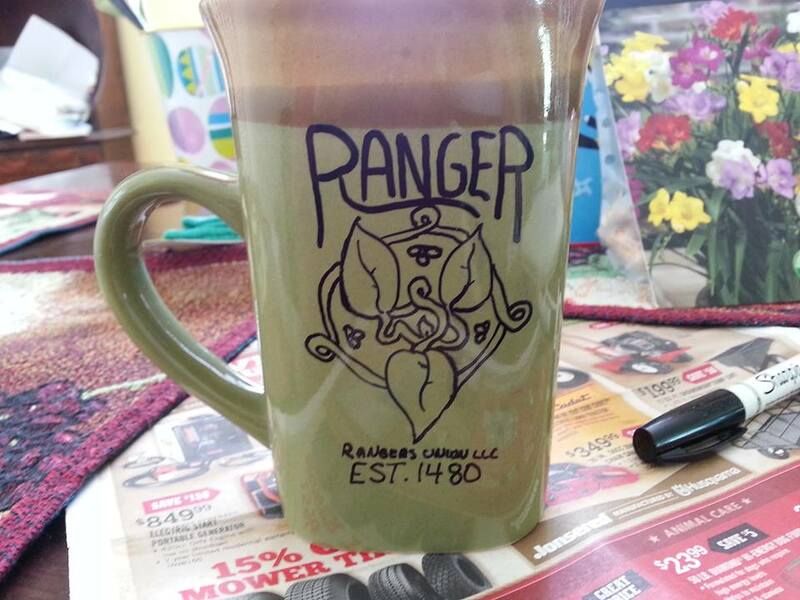 The green and brown got me thinking about rangers so I decided to do a mug for the Rangers Union featuring the triple leaf design that I’ve described in my books. 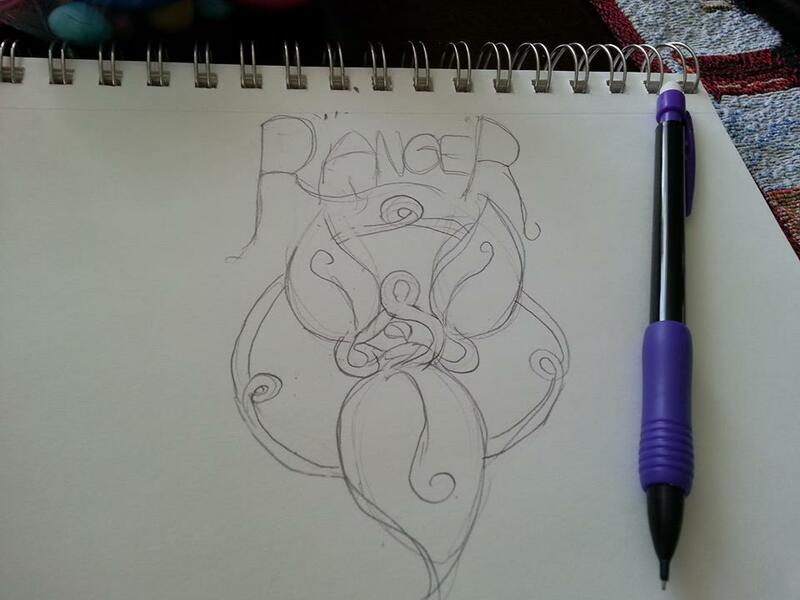 The Rangers Union Logo is a registered trademark of the Rangers Union LLC ®1480. Unauthorised use or reproduction of the Rangers Union Logo is in direct violation of Imperial Law and any and all violators may face harsh penalties including jail time and/or a fine of up to $12,000 dollars and/or death. Hey! Chicken wire is on sale at True Value. A little swipe gets rid of wonky lines. Back to work. And because I’m being silly, I’ve added a demotivational quote on the back to remind me that as bad as I have it, it could be worse. I could work for Gruthsfield. 5. Time for baking! Most sites vary on times and temperature, but they all agree on one thing: put your mug in while the oven is still preheating. 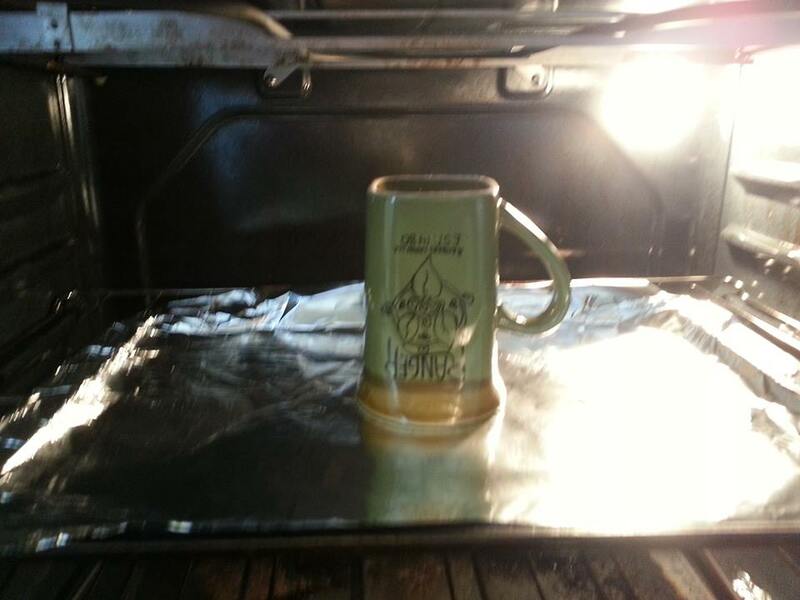 This prevents temperature shock and further chance that your cheap-o mug might crack during baking. I put the mug upside-down because I think it will prevent browning on the rim, but what do I know? I used foil because I didn’t want any of the mug to get caked on creosote on it from my ancient cookie pan. Now for the fire gnomes to do their job. I do my mugs at 425° for 30-35 minutes, checking to see if the mug is turning brown for any reason or catching fire or whatever. It does stink. It’s on par with doing Fimo jewelry or painting your nails for bad odors. Annoying but not lethal or life-altering and it doesn’t make my food taste gross afterwards, thank goodness. 6. 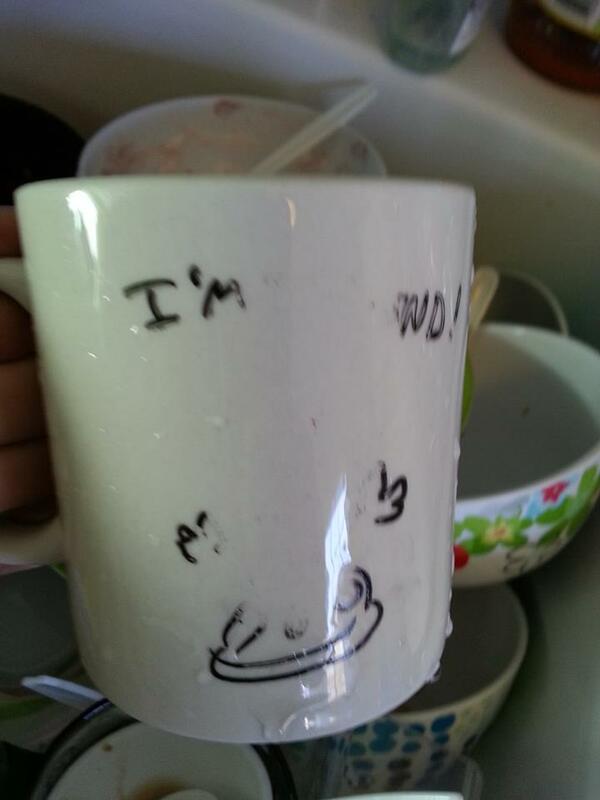 After you’ve taken out your mug and allowed it to THOROUGHLY COOL. I recommend you let the design “cure” for 24 hours before washing, to prevent any design damage caused by the paint not cooling thoroughly. After that, light hand washing in warm water should take care of any washing needs from then on. Now, if you’re really brave I’ve been TOLD you can put them in the dishwasher, but I’m hesitant to put my art to the test. I WILL say that the designs are REALLY tough. I scrubbed at the fox mug with a scrubby sponge in HOT water and the art didn’t budge! You might get some cloudiness with darker designs but any dark stains wipe away easily and I haven’t had any cloudiness after the first wash. So there you go! Mug designs that you can do yourself at home! I’m also starting to take commissions on mugs myself, so if you’re interested, please send me a note at beppo_the_monkey[at]yahoo.com ! I’m starting to price them at $20 + shipping, but we’ll see what my research on shipping shows. Hope this helped! Happy baking!